I have been trying to help my husband enjoy the taste and texture of fish so that it can be included in his diet more frequently. He is beginning to adore any type of fish blackened, but I wanted to give him more choices. I asked friends for their favorite fish recipes to give myself a larger repertoire to choose from. Personally, I enjoy fish for all of its simple flavor so have never, until now, thought much of ramping it up. 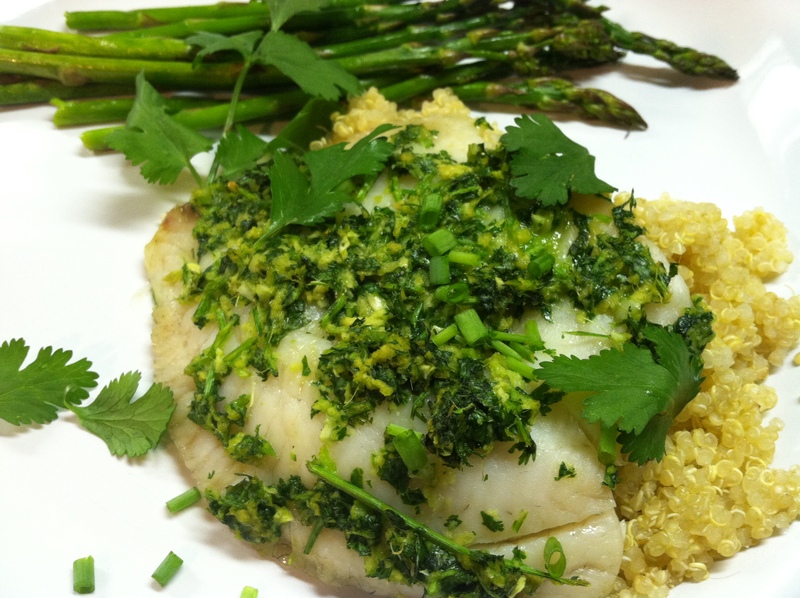 Finding new fish recipes are still top of my culinary to do list, so any ideas shared would be greatly appreciated. This recipe was given to me by two followers of the blog, Ginger and Cilantro Baked Tilapia from The Kitchn, one of my favorite food blogs. One of the comments under The Kitchn’s recipe stated that the finished fillets tasted too strongly of ginger. It was a strong flavor to season the fish that I was after, hoping to mask the fishy flavor that my husband dislikes, but I decided to use the topping on several fillets to lessen the amount on each. The fish was still pretty pungently seasoned but it did the trick. Due to the amount of intense flavors in the recipe and the addition of the oyster sauce I was able to omit salt from the recipe but still gave my husband a hefty wedge of lemon to squeeze on his finished fillet. It made a beautiful, tasty lunch for the four of us, with two extra portions to save for another meal, served over quinoa with grilled asparagus. Considering how very green the finished plate of food was, I think Hubby’s coming a long way learning to eat his dark green vegetables, as well, don’t you? 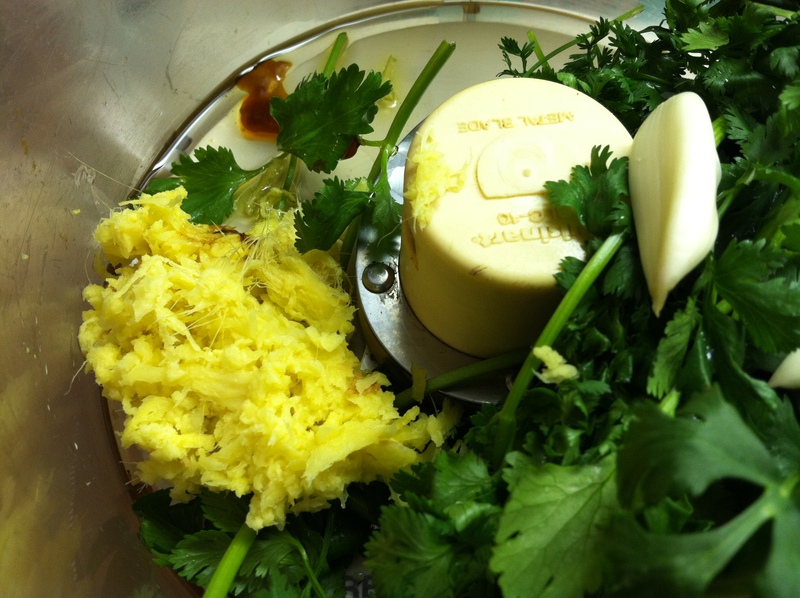 I made only minimal changes to the original recipe but will probably cut back on the amount of ginger and cilantro I use the next time I make it. The seasoning puree would also work nicely on other types of fish, I’m sure. 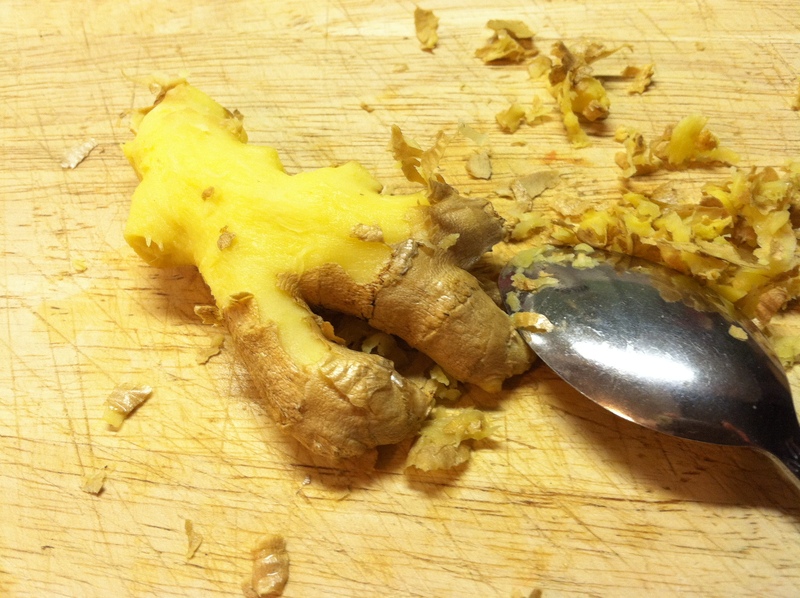 Peel the ginger by scraping it with a spoon and cut into smaller pieces. Add it and all of the remaining ingredients together in the bowl of a food processor, but the fillets, of course. Spread each fillet with the finished topping on both sides. Lay the fish fillets on a baking pan and bake for 8 to 10 minutes.